LOVELY SOFT PURE COTTON MATERIAL AND I WILL ENJOY WEARING THIS PRETTY BLOUSE. 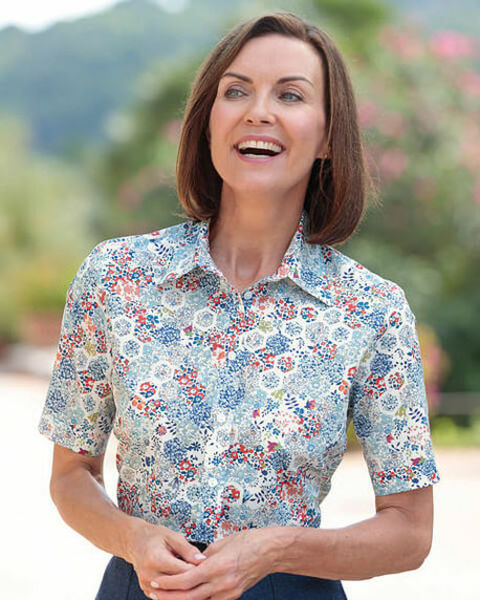 "LOVELY SOFT PURE COTTON MATERIAL AND I WILL ENJOY WEARING THIS PRETTY ..."
Ladies pretty patchwork Liberty print blouse on pure Tana lawn in shades of red spice, sapphire, cornflower and mulberry on an ecru base. Short sleeved style with two-piece collar and gently rounded hem. Mock turn back to sleeve hems. A stylish addition to your wardrobe.